The Pens Hockey Show: An Avalanche of wins for the Penguins! Can they continue? An Avalanche of wins for the Penguins! Can they continue? It has been a wild two days for the Pittsburgh Penguins since their 5-3 victory over the Columbus Blue Jackets on Sunday. They have bounced back from an earlier slump to put together a four-game win streak. 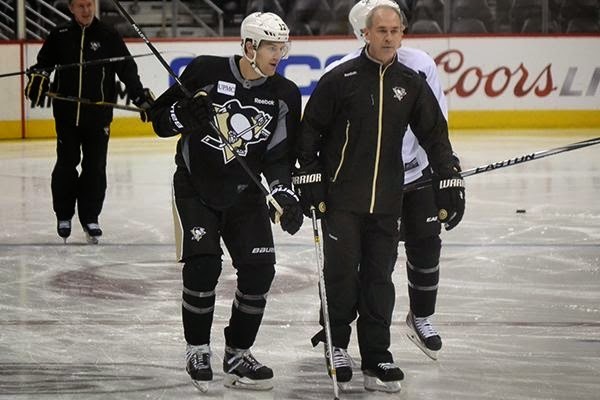 However, the Penguins have made a few new changes to the roster since Sunday and they were not light ones. Their defense has been shaken up and they have lost two young, talented players. It was announced yesterday, that the Penguins had acquired veteran defensemen Ian Cole from the St. Louis Blues in exchange for Robert Bortuzzo and a 2016 seventh-round draft pick. Bortuzzo was known for his tough defensive work and it will be a sad loss for the team. The Penguins also traded Simon Despres to the Anaheim Ducks for former Penguins defensemen Ben Lovejoy. Despres was known for his hard hits, while still being able to jump up in offensive plays. He reminded me of a young Kris Letang. His loss hit hard for the fans. Lovejoy comes to the team with 99 hits, which puts him second among the Penguins defensemen, only behind Letang with 107. While Ian Cole is a +16, which is second, only behind Paul Martin with +20. Only time will tell, if this is the right move by the Penguins or will they suffer in the long-run. We can get stuck in the past and debate all day about the trades, but tonight we focus on the Penguins taking on the Colorado Avalanche. They start a four game road trip out to the west tonight. They come into this contest with six wins in their last seven games against the Avalanche, dating back to December 3, 2009. As I stated earlier, the Penguins are riding a four-game win streak. During those four games, the Penguins have scored 18 goals to their opponents nine; have tallied 122 shots to their opponents 107; capitalized on six of 18 power-play opportunities; and killed off 11 of 13 penalties. A big part of their success in recent games it the success of their special teams. Their power-play, which was having trouble, finally is starting to click on all cylinders. They have scored a power-play goal in four consecutive games. Each game they seem to get better and better. Such a successful power-play starts with the two-headed monster of Sidney Crosby and Evgeni Malkin. In their last four games they have an combined 16 points (five goals and 11 assists). Malkin has made such an impact that he was named the National Hockey League's (NHL) third Star of the week for the first week of March. In addition, the Penguins have the fortune of getting production from their other players as well. 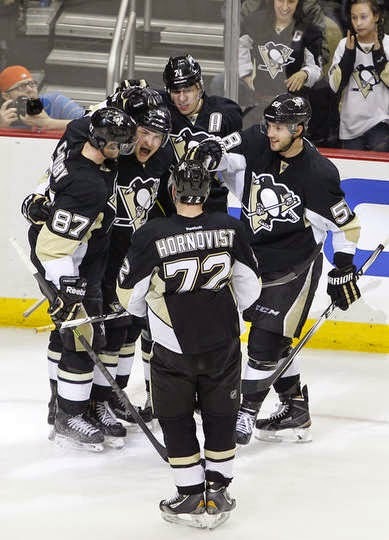 Guys like Blake Comeau who is tied with Chris Kuntiz for game-winning-goal leaders among the Penguins with five. He scored the only goal in their 1-0 overtime win against the Avalanche, this season. He has been clicking well on Malkin's line and look for him to come up big tonight. Another key guy is the third line center, Brandon Sutter. He has five points (two goals and three assists) in his last eight games. The Penguins have to spread out the offensive production to their other lines, so their top two lines don't get tired out before playoffs. They not only have a offensive on fire, but the defense for the Penguins has been going above and beyond. Even though they have lost two young, talented guys they still have a solid group of guys. Letang leads all NHL defensemen in points with 49 (10 goals and 39 assists). Talk about a Norris Trophy candidate. Letang has been phenomenal and so has his defensive partner, Martin. Martin has been a +11 since February 1st, which ranks him third in the NHL. Those two guys are the nightmare for any team's top unit. The Penguins have also been getting contribution from their younger guys on defense like Derrick Pouliot. He has notched two goals this season, which both have been game winners. He scored the game winner during Sunday's games versus the Blue Jackets. The Penguins defense is able to jump up in plays and feel comfortable doing so, because of the amazing work of netminder Marc-Andre Fleury. He is only one win shy of 30, which would be the seventh time in his career, he has achieved such a feat. The Penguins have the momentum to get another win tonight and start out their Western Conference trip on the right foot. Putting together wins on the road will help them in getting a better seed before the playoffs. It's a late night game, but the Pittsburgh Nation is ready! Lets Go Pens! A quick injury update: Christian Ehrhoff was at practice today, but it doesn't look like he will play tonight. 1:35- Hornqvist with a chance up front, but can't get a stick on it. 2:27- Empty net for the Pens! 3:46- The Avs score, but the referees wave it off right away for goalie interference on Fleury. 5:03- Landeskog Scores. Landeskog comes flying into the Pens' zone and undresses Pouliot. He blasts one past the blocker of Fleury. 3-1 Avs. 6:48- Perron is battling hard in front of the Avs net! 7:37- Malkin's game is on a whole other level. He is engaged in beast mode right now! 10:15- MALKIN SCORES! Mitchell turns over the puck to Malkin who speeds into the Avs zone! Malkin skates to the center and his first shot is blocked! He gets the puck back and snaps his second shot past Varlamov! 2-1 Avs. 11:44- Fleury makes a save on a shot by Duchene. 13:40- Mark that down as a successful penalty kill for the Pens. 15:40- Pouliot heads to the box for interference and the Avs get a power-play chance. 16:26- The Pens are finally getting some sustained pressure. The Pens fourth line with good forechecking and puck possession in the offensive zone. 18:51- Nice start to the period by Malkin's line. Got a few chances on net and had some sustained offensive pressure. 20:00- Third period time! The Pens have to come out with more life in their game and get in the face of Varlamov! Lets Go Pens! 0:00- The Avs have the 2-0 over the Pens after two periods. 1:06- Avs ice the puck and the Pens get an offensive zone face-off chance. 3:31- The Pens look sluggish and need to pick up their game if they want to get into this one. Varlamov is sharp, but the Pens have to get in his face and get a dirty one. 5:31- Mackinnon Scores. Hejda gets plenty of room and snaps a shot on net. Letang and Mackinnon drive battle behind Fleury. The puck goes off Mackinnon's skate and into the net. 2-0 Avs. 7:16- Even with the Pens struggling to get their offense going, the pairing of Lovejoy and Pouliot looks to be a good one. They are working well together and Pouliot continues to gain confidence. 8:33- The Pens are having trouble connecting the first pass out of the defensive zone. This is leading to turnovers and icing calls. They need to clean it up. 11:53- Power-play for the Pens comes to an end. 13:53- Now the Pens will head onto the power-play as Hejda is called for holding. 14:13- Last couple of shifts have been much better for the Pens. Varlamov holding down the fort for the Avs. 15:08- Lovejoy with a shot from the blue line, which is gloved up by Varlamov. 16:12- Perron and Hornqvist get a 2 on 1 chance. Perron makes a beautiful pass over to Hornqvist, but Varlamov robs him with the pad. 18:13- Way too many turnovers for the Pens to start this period. Not a good start for them in this second period. 20:00- The Pens are back for the second period and have to kill off a Avs power-play for another 1:24! Take it to them! Lets Go Pens! 0:00- That is it for the first period and this game is scoreless. 0:10- Fleury with amazing glove save! 0:39- Some offensive zone time for the Pens and they get a chance to cycle the puck, but Comeau ends up taking a tripping penalty. Another power-play chance for the Avs. 2:13- Not the most exciting hockey to start. Maybe it will pick up in the next two periods. 4:09- Mark that down as a successful kill. Fleury with a save, at the end of the Avs power-play, on Barrie. Unreal save. 4:52- Winnik gets a short-handed chance, but Varlamov gets a piece of the puck to direct it up into the netting. 6:09- When the Pens finally get some zone time, Comeau is called for interference and the Avs get the first power-play of the game. 6:55- Crosby steals the puck and passes across the center to Perron. Perron is robbed by Varlamov. Best chance for the Pens, so far. 8:59- Kunitz snaps one, but Varlamov makes the easy save. 10:01- The Pens are having trouble getting into the offensive zone and stepping up. Avs are breaking up most of their attempts in the neutral zone. 12:06- The Avs forwards have some good speed coming into the Pens' zone. The Pens are having some trouble dealing with their speed. 13:25- Barrie comes in late to snap a shot on net, but Fleury stands tall to make the glove save. 15:46- Not much flow to start this game. There have been a lot of whistles in the beginning of this contest. 18:33- Fleury comes out to challenge Mackinnon and makes the save. 20:00- Let the Western Conference trip begin! It's a late night game, but the Pittsburgh Nation is ready! Get to work early Pens! Lets Go Pens!